Her post highlighted painfully the difficulty many Whites have when discussing race. All of her White Facebook friends became defensive. They told her they were disappointed in her for blaming all Whites. They told her they weren’t responsible for slavery. They told her that as individuals, they are “colorblind”. They told her they try to be good White people. They told her that felt sad after reading her post. Why is it that members of a dominant group—in this case, Whites—become so defensive when members of a marginalized or oppressed group discuss their experience of racism? Whites, even if they are not racists on an individual level, benefit from White privilege (Diangelo, 2015, para.5), and many Whites don’t like to admit it (nor do they seem to understand that having privilege doesn’t mean life is easy for Whites, but that it is easier, in certain, and often powerful ways). Many Whites don’t have the experience of feeling marginalized, and therefore lack experience discussing race (Talking Race, 2009, The Pink Poodle Section, Para. 20). They don’t know what to say, or what they can say. Everyone is a little bit racist. But people who claim to be “colorblind” or who proverbially refer to their —one— best friend who is Black (or Hispanic, or Asian, Gay, etc) are in denial. 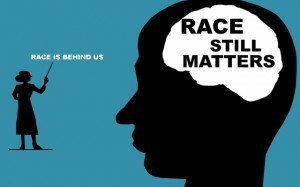 Unfortunately, denying your even occasional racist thoughts can lead to implicit biases, which can have fatal consequences, particularly for young Black men. Whites in general are protected from race-based stress, largely due to the White experience being considered the “right” or “universal” experience. When the concept of “White is right” is challenged, many Whites feel threatened and defensive. On the morning of my friend’s post, the day after the news of the non indictment was announced, I scrolled through my Facebook feed, like I usually do in the morning. In between the morning news and a few updates from friends and family, my friend’s post appeared. I quickly scanned it, felt my body tense and thought, “I’m not ready to read this.” After I had some time to wake up, I went back to her post. This time, I took a deep breath before reading it, and allowed myself to feel whatever feelings emerged. I read her post again, and then read the reactions from her Facebook friends. When I reflected on my feelings, I noticed that initially I thought I wanted to write a comment that would make her feel better. But when I allowed myself to feel whatever emerged, I admitted to myself that what I really wanted, was to write a comment to make myself feel better. I too, was upset about the non indictment, but I’m not the mother of a Black son, and my experience and upset is not the same as my friend’s. I wanted to say something comforting to her, but really, what is there to say that would make a difference? Lastly, I acknowledged that I felt uncomfortable because maybe on a day-to-day basis I don’t do enough to combat racism. Instead, what I chose to do was to read the reactions and comments to her post with openness and curiosity. I listened and I felt. The ability to enter into a conversation from a group-centered approach is a critical skill for meaningful dialog on race. Many Whites see themselves as individuals, and different from those who participate in structural racism (Diangelo, 2015). The willingness to mindfully attend to a conversation from a place of openness and curiosity, along with humility is essential for the development of empathy– a key ingredient for discussing race, privilege, and oppression. *Facebook story used with permission.